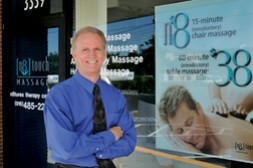 Massage therapy for pain management, stress, and relaxation in Sacramento. Dr. Alward's El Camino Avenue office is conveniently located near the northwest intersection of El Camiono Avenue and Watt Avenue. Massage therapy physically and emotionally rejuvenates the body and mind by relaxing the muscles and easing and soothing your aches and pains. We provide customized massages, and for added convenience we offer appointment times to accommodate your busy schedule: We are open Monday through Saturday, mornings, afternoons, and evenings. Massage is the practice of soft tissue manipulation with physical and functional goals. Massage involves acting on and applying pressure, tension, motion, or vibration manually on the client's body. Target tissue may include muscles, tendons, ligaments, skin, or other connective tissue as well as lymphatic vessels. What makes our massage therapy clinic unique is the availability of state-of-art chiropractic treatments. Dr. Alward has been providing chiropractic care to Sacramento residents for thirty years. This is the most common form of massage. Relaxation massage is for stress and relaxation, as well as for preventive and wellness health care. Swedish massage is the most common form of relaxation and stress reduction massage. Swedish massage is the first system of therapeutic massage. One of the goals of Swedish massage is to increase circulation by following the flow of blood from the body to the heart. Swedish massage can also shorten the recovery time from muscular strains and reduce stress. The basis of Deep Tissue massage is to release chronic patterns of tension and pain.This technique uses slow strokes and deep finger, palm, elbow, and forearm pressure on the contacted area, either following or going across the grain of muscles, tendons, or fascia.Techniques such as friction, direct pressure, and compression can also be used. This type of massage is called "deep tissue" because it focuses on the deeper layers of muscle tissue. Sports massage helps athletes to increase their endurance and performance, as well as help them recover quicker from competition or injuries. Sports massage is also helpful in reducing the risk of injuries. This technique helps the novice or professional athletes before, during and after training events. Sports massage helps promote flexibility, remove muscle fatigue, improves endurance, and prepares the athlete to compete at their absolute best. This type of therapy combines massage techniques with hot stones to increase relaxation and allow the therapists to work deeper into the tissue. Aromatherapy is the use of essential oils that have different therapeutic benefits. The essential oil is added the the massage lotion or cream to enhance the therapeutic benefits of the massage. Trigger Point Therapy consists of treating myofascial trigger points, usually focusing on specific areas of chronic pain. This type of massage therapy works with expectant mothers to help alleviate discomforts associated with pregnancy and after pregnancy. Massage therapy has been proven to help in restoring body movement, reduce pain, and decrease depression in the elderly. [n8] touch is a registered trademark of [n8] touch, Inc.